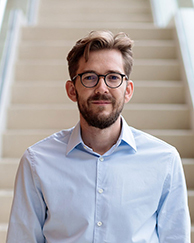 Niels Joachim Gormsen joins Chicago Booth as a Neubauer Assistant Professor of Finance in 2018. His research interests include financial economics and empirical asset pricing. His research was awarded the AQR Top Finance Graduate award in 2018. At Booth he will teach investments. Previously, he taught corporate finance at Copenhagen Business School. Gormsen earned a PhD in financial economics, an MSc in advanced economics and finance, and a BSc in international business all from Copenhagen Business School. During his graduate studies at Copenhagen Business School, he spent time as a visiting scholar at Harvard University and Columbia University. Outside of academia, Gormsen enjoys sailing. In 2011, he won the Youth World Championship in the Olympic 49er dinghy. We estimate and analyze the ex ante higher order moments of stock market returns. We document that even and odd higher-order moments are strongly negatively correlated, creating periods where the return distribution is riskier because it is more left-skewed and fat tailed. Such higher-moment risk is negatively correlated with variance and past returns, meaning that it peaks during calm periods. The variation in higher-moment risk is large and causes the probability of a two-sigma loss on the market portfolio to vary from 3.3% to 11% percent over the sample, peaking in calm periods such as just before the onset of the financial crisis. In addition, we argue that an increase in higher- moment risk works as an "uncertainty shock" that deters firms from investing. Consistent with this argument, more higher-moment risk predicts lower future industrial production. We show theoretically that the required compensation for time-varying betas in the CAPM can be estimated by a precisely defined conditional-risk factor, which can be used in factor regressions. Both in the U.S. and global sample covering 23 countries, all major equity risk factors load on our conditional-risk factor, meaning that their market betas vary over time and that this variation explains part of their average returns. Studying the economic drivers of these results, we find evidence that this conditional risk arises from variation in discount rate betas (not cash flow betas) due to the endogenous effects of arbitrage trading. I document that the term structure of holding-period equity returns is counter-cyclical: it is downward sloping in good times, but upward sloping in bad times. This new stylized fact implies that long-maturity risk plays a central role in asset price fluctuations, consistent with theories of long-run risk and habit, but these theories cannot explain the average downward slope. At the same time, the cyclical variation is inconsistent with recent models constructed to match the average downward slope. I present the theoretical source of the puzzle and suggest a new model as a resolution. My model also shows that the counter-cyclical term structure has implications for real activity, which I verify empirically: in bad times, long-duration firms decrease their investment and capital-to-labor ratio relative to short-duration firms. We test whether the low-risk effect is driven by (a) leverage constraints and thus risk should be measured using beta vs. (b) behavioral effects and thus risk should be measured by idiosyncratic risk. Beta depends on volatility and correlation, where only volatility is related to idiosyncratic risk. We introduce a new betting against correlation (BAC) factor that is particularly suited to differentiate between leverage constraints vs. lottery explanations. BAC produces strong performance in the US and internationally, supporting leverage constraint theories. Similarly, we construct the new factor SMAX to isolate lottery demand, which also produces positive returns. Consistent with both leverage and lottery theories contributing to the low-risk effect, we find that BAC is related to margin debt while idiosyncratic risk factors are related to sentiment.